OPERA FANTASIES were very popular in the 19th century. Based on well-known melodies from popular operas these fantasies gave performers the possibility to demonstrate their virtuosity and ability to improvise. This is a tradition that goes back a long way. Bach, Mozart and Beethoven were all known as great improvisers. With the transition of the music salon of the aristocrats to the concert hall of the bourgeois, these fantasies became more elaborate and were finally put into print to make them available to all performers. This was the beginning of music marketing. Thanks to the mastery of Liszt and Thalberg, this genre of music was elevated to an unrivaled level. The REMINISCENCE DE LUCIA DI LAMMERMOOR was a favourite opening piece for Liszt in his legendary recitals during his years as a piano virtuoso. Maestro Incenzo discovered in the Library of the Santa Cecilia Conservatory in Rome a huge collection of 19th century FANTASIES for clarinet and piano. Most are based on Italian opera themes. They use the form of potpourri and variation. The clarinet part is extremely virtuosic. His involvement in this genre led him to compose the FANTASIA VARIATA, a tribute to the acrobatic virtuosity of this tradition. The NEAPOLITAN SONGS are being accepted more and more as part of our musical heritage. Recently, the "Three Great Tenors" have been bringing them to many sports arenas throughout the world. Anyway, the music itself continues to survive: their powerful melos will be loved from generation to generation. Born in the very city of Naples, these songs describe in a most nostalgic way the life and scenery of this beautiful city. Listening to this music, we can visualise the city, shimmering in the sunlight, we can feel the air at the beach in the evening and we can hear the waves of the sea. We can see the sky, where the moon and the stars appear one by one. These songs express happiness, loneliness and homsickness from being far away from their beloved city, and of course love with all its sweetness and bitterness. In the 19th century these songs were performed to the accompaniment of the violin, the mandolin and later the guitar. Rehearsing togehter with Maestro Incenzo, a native of Naples, gave me the opportunity to experience the very heart of Naples through these songs. As accompanist at the piano, I tried to imitate the colours and the atmosphere of a great musical tradition. In the studio itself the accompaniment was therefore mostly improvised. MICHELE INCENZO was born in Frattamaggiore (Naples). He studied at the Conservatory “S.Pietro a Majella” in Naples. Michele Incenzo is known in the concert world as a clarinet “virtuoso”. Principal of the lrish Radio Symphony Orchestra and professor at the Royal lrish Academy of Music in Dublin for 7 years, he has occupied the position of first clarinetist of the Orchestra dell'Accademia Nazionale di Santa Cecilia in Rome for 30 years, performing under the world's most outstanding conductors. Many composers, both from Italy and elsewhere, have written music expressly for him. Teacher in Italian music conservatories since 1960, form 1974 to 1997 he held the position of clarinet professor at the Santa Cecilia Conservatory in Rome. 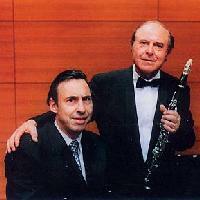 Michele Incenzo has been president of the International Clarinet Association in Italy, for many years. He has recorded discs and collaborated in television broadcasts. In 1994 his original “16 STUDI DI PERFEZIONAMENTO” for clarinet was published by Musica Appassionata, Postbus 44,3200 Aarschot, Belgium, His indisputed artistic and human gifts have been admirably described by Pamela Weston in her defintive book “CLARINET VIRTUOSI OF TODAY”(published by Egon-London). Since 1998, Michele Incenzo has been playing together with Swiss pianist Richard Frank. Their tour of Italy and Japan during 1998 and 1999 was particularly successful. RICHARD FRANK was born in Zurich in 1953. He studied with Irma Schaichet, a student of Bartok and Busoni Later he received a teaching certificate in piano SMPV. In 1976 he passed his artist diploma at the Academy of Music in Freiburg, Germany under Professor Edith Picht-Axenfeld. Won the Kiefer Hablutzel Prizes in 1976 and 1977 which enabled him to study at the Juilliard School of Music, New York. He took a Master Course with the late Rudolf Firkusny. Mr.Frank has given concerts in Europe, the USA, China, Singapore and Japan, where he has also appeared as soloist with orchestras. Intensive involvement in the work of Franz Liszt led him to found in Switzerland and in Japan, the Franz Liszt Society Switzerland-Japan, which has received international acclaim for its innovative concerts and its busy exchange program. Since 1987, he has been president of the Society. The Society welcomes music lovers worldwide. Since 1979, Richard Frank has been teaching piano at the faculty of the music department at Doshisha Women's College in Kyoto, He also holds a chamber music course at the University of Education in Kyoto. Outside Japan, Mr.Frank has been given masterclasses in Lenk, Switzerland, Assisi-Orvieto, Italy and at the National Music Academy in Shanghai, China. He has also released a ＣＤ for ‘aurophon’F.LISZT:THE COMPLETE PIANO CONCERTOS (two recently discovered concertos in addition to the two well-known concertos), which can be obtained through the society.